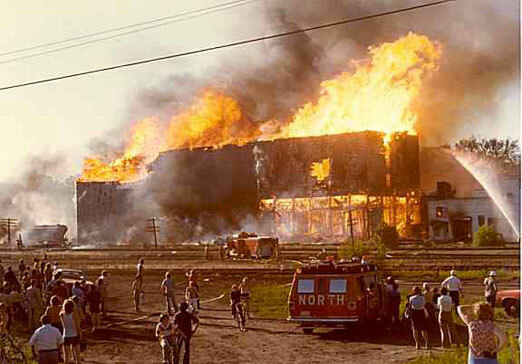 Most St. Louis Parkites who were in residence in 1977 remember the devastating fire at the Belco grain elevators on May 11 of that year. 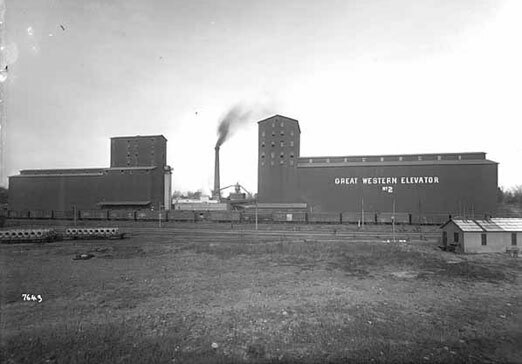 The Great Western Grain Elevator was built in about 1893; an article on April 1 of that year in the Minneapolis Tribune stated that the arrangements had been completed. It was located on the Minneapolis and St. Louis railroad tracks at 3120 Glenhurst Ave. in the Manhattan Park neighborhood. In 1904 it suffered damage in an August tornado. In 1913 it was owned by Hales Hunter and held barley. This photo is identified as Great Western Elevator No. 2, taken in 1914, on the Minnesota Historical Society website. In 1918 it was owned by Union Elevator Co., which also owned at least one house in the neighborhood. In 1926 it was owned by Hales Hunter (The foreman was Van McKusick, who lived at 3040 Inglewood). Hales Hunter had water connected in 1938. By 1939 it was called the Belco Elevator, still owned by Hales Hunter. 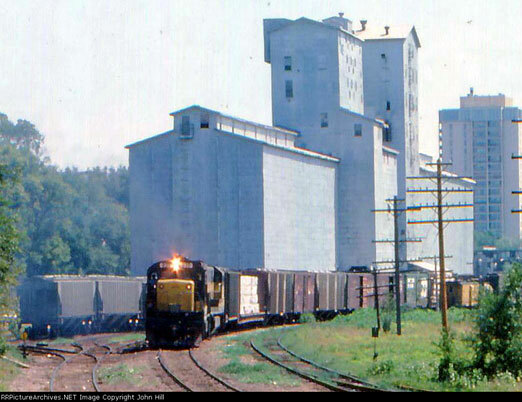 The elevators had been owned by the Burdick Grain Co. of Minneapolis since 1950. Allan L. Burdick was the Chairman of the Board, and Vernon Geiger was the President of the Company. The elevators burned down in a spectacular inferno on May 11, 1977. At about 5:30 p.m., 28-year-old David Berscheit was cleaning corn in #1 when a small fire started. He tried to put it out with a blanket, but the 500,000 bushels of corn in the wooden structure exploded, throwing Berscheit and leaving him with burns over 60 percent of his body. 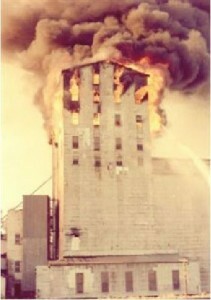 The fire spread to the #2 elevator, which held 1 million bushels of barley. Chief Luke Stemmer recalls “The fire was believed to have started as a result of a series of explosions each one bigger than the one that proceeded it, with the last on blowing the roof off of Belco 1’s head house.” Flames shot 100 feet in the air, and the smoke was visible 30 miles away. Thousands of spectators converged on the site. The 4000 block of 31st Street was evacuated, displacing 200 residents as a precaution against flying ash that landed on rooftops. Neighbors had expressed concern about the structures, citing several small fires in the past. Click here for a site with pictures and audio of the radio traffic. In 1999 the site was replace by the three-block long Inglewood Trails apartment complex.